Fill out the contact form and we will give you directions to the nearest facility. Or you can organize your own collection--all you need is a place to collect and a place to store the mobility devices. Rotary Clubs, Lions Clubs, Optimist Clubs, Girl Scouts, Boy Scouts, Awana, etc. 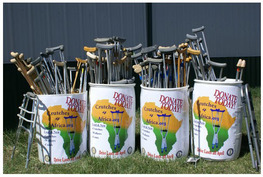 You will need to set up a 55-gallon drum or garbage can to collect the crutches, canes, walkers, wheelchairs, etc. Contact us and we will give you advice on how to organize your collection. 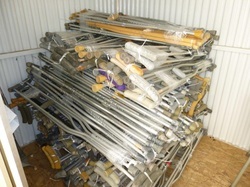 We can also make arrangements for what to do after you have crutches ready for shipping. After the crutches have been stretch-wrapped into bundles of three, a good way to stack them is in this pattern of alternating directions in each row. Stacking in this way prevents the crutches from tipping or falling. Storage should be donated whenever possible and can be a barn, shed, or garage. Storage should be available for the duration of your collection project and should include additional time to prepare for transport and shipping. The average time for storage is 6 to 10 months. The location should be relatively accessible for the pickup of mobility devices. Keep in mind that collected items may be transferred later to a larger vehicle than those involved in the collection process. Print copies of this informative and colorful brochure to help you publicize the collection event.